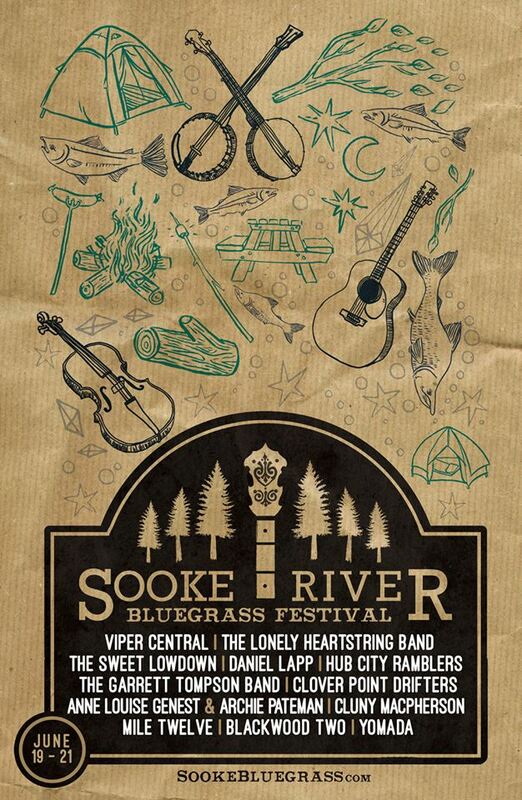 The 13th annual Sooke River Bluegrass Music Festival - Buy your tickets now! Friday June 19th to Sunday June 21st at the scenic Sooke River Campground. 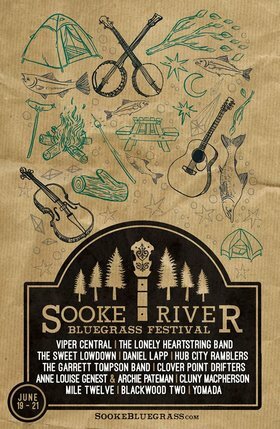 2015 marks the 13th year that the Sooke River Bluegrass Festival will be held on Father's Day weekend at the Sooke River Campground on the Sooke Flats. The festival is family friendly and features an array of local and visiting acoustic musical talent, along with food and merchandise vendors, instrument seminars and beautiful scenery. Weekend passes are available now for only $50 athttp://www.brownpapertickets.com/event/1433132. Day passes are also available. Camping passes need to be booked separately at http://www.sookecommunity.com/camping/ or phone 250 642 6076. The Sooke River Campground is a family oriented campground located in a well maintained beautiful setting along side the shores of the Sooke River. The 2015 festival line up includes: The Lonely Heartstring Band, a Boston, MA based acoustic quintet that create a unique blend of old and new styles that are rooted in the tradition of bluegrass; Mile Twelve, also from Boston, play contemporary bluegrass, blending their youthful energy with mature musicianship; Viper Central from Vancouver, BC love classic bluegrass, and regularly tour throughout North America and Europe; and from Vancouver Island, The Hub City Ramblers bring a repertoire of traditional old-time songs and instrumentals, as well as their own uniquely crafted originals; The Garrett Tompson Band play straight up bluegrass, and are inspired by J. D.Crowe and the New South, often considered to be one of the most influential bluegrass groups since the 1970s; The Clover Point Drifters play country, folk, blues and pop melodies served up in the bluegrass style; The Blackwood Two deliver a blend of original folk songs and traditional numbers with old-time charm; The Sweet Lowdown combine original songwriting and three-part harmonies with an old-time instrumental groove; Daniel Lapp, world renowned multi-instrumentalist, composer, teacher and producer; Archie Pateman & Annie Lou have been traveling musical roads together for years, playing a blend of original and traditional music, and YOMADA, the Young, Old-time, Music And Dance Association, will get you off your seat, and on your feet, with their fast paced old-time music.